I have embossed a background of butterflies and mounted this on gold card. Some of the butterflies are embellished with tiny clear acrylic gemstones. I have then attached it asymmetrically to the card. On top of this I have placed two gold butterflies. I have given the small butterfly a background of pink watercolour paper and the large butterfly a background of blue watercolour paper. 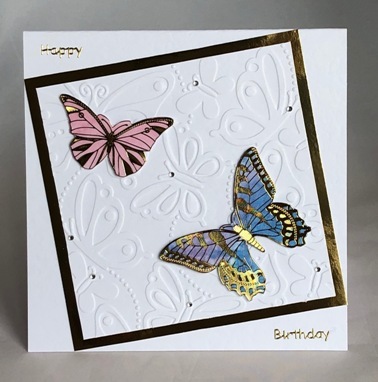 Happy Birthday is written in gold lettering at the top and foot of the card which is blank for your own birthday greetings. If ordering by phone, please reference card #782.